Auburn Hills, MI - Chrysler Group today announced the production launch of the all-new 2008 Jeep® Liberty which is being built at Chrysler Group’s Toledo North Assembly Plant (TNAP) in Toledo, Ohio. The all-new Jeep Liberty is being built alongside the Dodge Nitro which began production in August 2006. 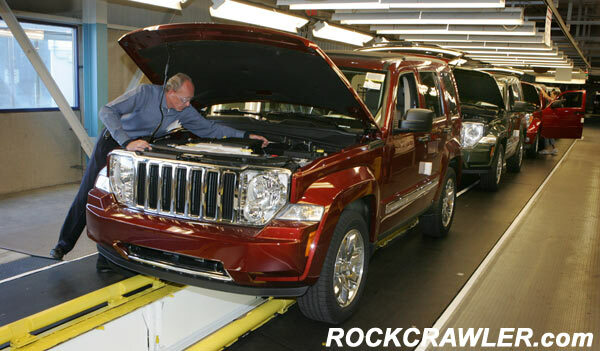 The 2008 Jeep Liberty continues Chrysler Group’s expanding Flexible Manufacturing Strategy (FMS), allowing the Company to bring new vehicles to market quickly and efficiently; and enable its assembly plants to manufacture multiple products on one assembly line. The Toledo North Plant was extensively retooled to manage the complexity of building two different models on one production line. Investments included multiple plant upgrades, improving quality, productivity and worker ergonomics. Last year, more than 160,000 square feet were added to the plant floor to enhance body and assembly processes. The all-new Liberty carried an investment 85 percent less than previous products. The vehicle is the second model of a two-model flexible manufacturing process implemented at TNAP. The retooling of TNAP is part of $3.9 billion spent on Toledo manufacturing capabilities that include an original $1.2 billion to build Toledo North (opening in 2001) and $2.1 billion for Chrysler’s Toledo Supplier Park, home of the all-new 2007 Jeep Wrangler and Wrangler Unlimited four-door. All-new from the ground up for 2008, the Jeep Liberty remains true to its legendary 4x4 heritage by offering two Jeep Trail Rated® four-wheel-drive systems – Command-Trac® and the all-new Selec-Trac® II. On-road ride and handling have been improved and refined with the new independent front suspension, new five-link rear suspension and rack-and-pinion steering. The Liberty’s exterior has been redesigned, and takes on a more rugged, classic Jeep look that is sure to captivate the attention of current Jeep Liberty owners and broaden its consumer appeal. Inside, cargo and storage space increases and seat comfort improves. Making its world debut is the new Sky Slider™ full-open canvas roof, an industry-exclusive; giving the Jeep Liberty that “Only in a Jeep” open-air experience. Remote start, rain-sensing wipers, memory seats and mirrors, and express up/down windows are added to the vehicle’s ever-growing list of available features and options. There are two models – Jeep Liberty Sport and Jeep Liberty Limited. Chrysler Group's Flexible Manufacturing Strategy allows the Company to produce a higher quality product faster and for lower cost. To balance production with demand, the FMS approach allows the Company to efficiently build vehicles that take advantage of a market niche, and to quickly shift production volumes between different models within a single plant or among multiple plants. FMS is being implemented product by product and plant by plant across the Chrysler Group. New investment is introducing state-of-the-art technology to Chrysler Group plants, enabling the company to produce more than one vehicle on a production line and conduct rolling launches of new models. Additionally, Chrysler Group's workforce is becoming more flexible with the implementation of team concepts and an increased emphasis on supporting assembly line operators. The Liberty assembly process has the capability of being installed and launched without facility downtime due to innovative 2+1 flexibility implemented with the introduction of the Dodge Nitro. The innovative technology allows the production of two different upper bodies to be produced simultaneously on the same assembly line. At the core of the new manufacturing process is a body shop comprising 150 new robots instead of the vehicle-specific heavy tooling that was previously used. The door, hood and lift gate assembly system is new, as are the side aperture assembly systems. Only the robots’ end effectors, or “hands,” need to change in order to build the different models. That tool change is done automatically, within the time it takes to cycle from one vehicle to the next. TNAP is flexible enough to vary production mix between two products anywhere from 0 to 100 percent of each model. A third model can also be piloted — or test-built — at the same time, helping reduce the time needed to make new-model changeovers. New methods of material flow are being implemented to manage the complexity of two models being built on one assembly line. An inbound part sequencing center is housed in the adjoining Stickney complex and manages more than 1,600 different parts that are used in the Dodge Nitro, Jeep Liberty and Toledo Supplier Park's Jeep Wrangler two-door and Jeep Wrangler Unlimited four-door build processes. In addition to sequencing, this center provides parts metering, kitting and container management to both Toledo North and Toledo Supplier Park Assembly Plants. Additionally, a significant portion of the TNAP facility is fork-truck-free, as dollies provide materials to production areas, improving both employee safety and productivity measurements. A new workplace organizational model, called Smart Manufacturing, is increasing the flexibility of the TNAP workforce, while fostering greater creativity and innovation from plant employees. This model is being implemented throughout the Chrysler Group's Manufacturing organization. In addition to extensive training, the new workplace model lets employees design their own workstations. These changes provide a better work environment for employees and give increased support to assembly line team members. "With the all-new Jeep Liberty and the new Dodge Nitro that was introduced here last year, the employees of TNAP are pleased to be contributing toward the Chrysler Group’s goal of world-class operational excellence" said Luis Rivas, Plant Manager – Toledo North Assembly Plant, Chrysler Group. 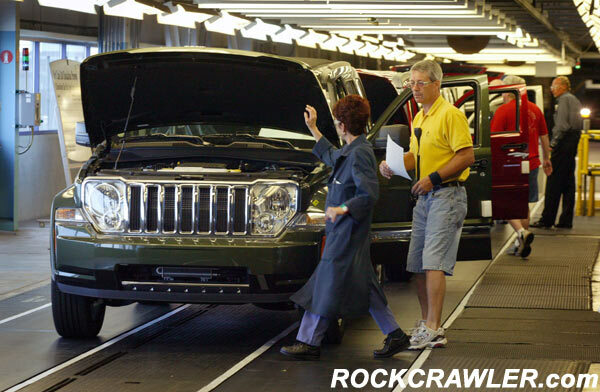 An eight-foot wide soccer ball and giant picnic basket on wheels were on display at the Toledo North Assembly Plant on Monday, July 23, 2007, to bring to life the Jeep brand tagline “Fun. Headquartered and manufactured in Toledo, Ohio.” The oversized items are two of 12 “fun wheels” featured in the Jeep brand’s national advertising campaign. Each “fun wheel” represents fun outdoor activities that are associated with Jeep vehicles, which are built in Toledo, the city where fun begins. The Toledo (Ohio), Complex, made up of the Toledo North Assembly Plant and the Toledo Supplier Park, has built Jeep-brand vehicles since the 1940s. The Toledo North Assembly Plant is 2.14 million square feet and builds the all-new Jeep Liberty and Dodge Nitro. The Toledo Supplier Park location is 1.502 million square feet and builds the all-new Jeep Wrangler and Jeep Wrangler Unlimited. Both plants are represented by United Auto Workers Local 12. Chrysler Group has a significant impact on Toledo and the state of Ohio with 6,238 employees statewide who generate $465 million in annual wages and provide more than $26 million in taxable income to the state. Chrysler Group, a good neighbor good citizen, sponsors various community events through its philanthropic arm, the DaimlerChrysler Corporation Fund, including the Art Tatum Jazz Heritage Festival, Toledo Urban League, City's Youth Entrepreneur Program, Toledo Opera, the Toledo Museum of Art, Valentine Theatre and the Diamante Awards.